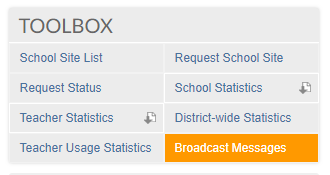 District administrators can send broadcast messages via email (not LoopMail) to all registered users. Those using our Plus product may also include the registered parents of selected schools in the district. Messages are delivered immediately to the inbox of the email address listed for each user's School Loop account. Since the messages are sent with a generic "from" address, recipients cannot reply to the sender. District admins can access this tool via a new link in the Toolbox located at the top of the right column in their user portals. Click Broadcast Messages in the Toolbox section. Choose from the list of AUDIENCE on the left. Check the Parents Only option if you wish to send a broadcast message limited to the parents of the checked schools. Type in the Subject and Message in the Broadcast Content section. NOTE: The body of your message may contain links, images and files. And like news, you may choose to style the text of your message using our rich text editor. Please note that images and files included in your message must first be uploaded to a locker or image album available to your user account. The created broadcast message can be seen in the list of all broadcast messages with the information on date, sender, and subject.